The King of Pentacles represents accumulation of wealth or success, abundance, reputation, status, generosity and leadership. 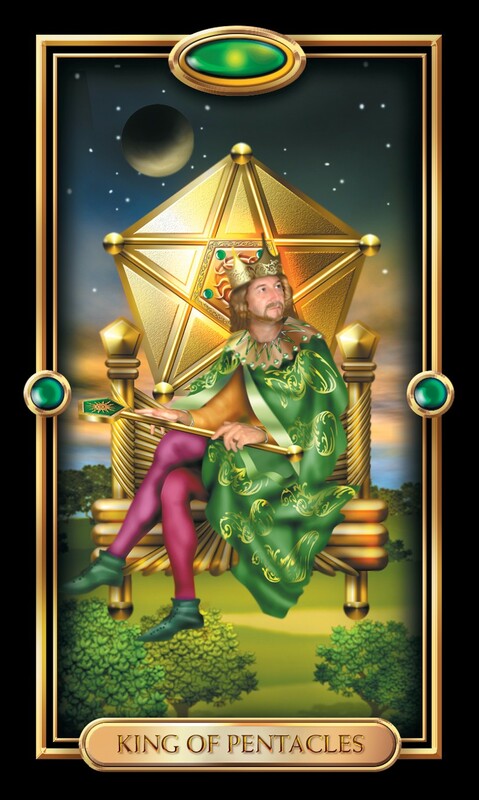 We have pictured some one with a great deal of personal responsibility to a larger group or organization, but who is not burdened or oppressed by it; instead the King of Pentacles feels rewarded, fulfilled and proud of his position. He is security- and stability-loving by nature, symbolized by the Taurean bulls that surround his throne, and is thus the ideal leader for the direction of the kingdom. He has the diligence, patience, and competence to lead, paired with many decades of experience, as well as honors and riches from his past succeses. His cloak blends almost indistinguishably into the palace garden around him, symbolizing at once his comfort in his position of responsibility and influence and that he has not lost connection to the vitalizing forces of nature nor the simple pleasures of life. This may signify that you need to be cautious, conservative or pragmatic in your approach, especially if you are in a position of leadership or have to make a decision. Refer to experts and well-accomplished masters in your field. This card symbolizes an effective leader, a generous or abundant father-like figure, or a conservative, traditional figurehead. Alternatively it may reflect some one with vast amounts of practical knowledge who shares and dispenses this wisdom with others, or as the head of a group or organization. It may be advising you to be a source of stability, direction or material resources for people around you, or you may need to seek the guidance of such a person. It may represent a master businessman, or leveraging your strength and resources into even greater material gain. In general the King of Pentacle advises something rather stern or dull sounding: be responsible. Yet you are likely to find great personal satisfaction in upholding duties, tending to responsibilities and even making personal sacrifice for the good of the whole. The King of Pentacles card is connected to the Sun in Taurus, as a symbol of material love, sensual pleasure and business approaches. The King of Pentacles card can represent success in business due to your stable, hardworking, authoritative character. You likely achieve success through discipline and may be an expert in your field. You may be motivated to have control and power and provide a secure, stable home. When the King of Pentacles card is reversed, it may mean you are being too conservative in your life. You may be having difficulty with change or falling behind on things you need to do. Stubbornness and fear may be blocking positive change in your life if you are expecting the best for yourself and the worst for others. The King of Pentacles card may mean that an established, fair, and wise man will play a major role in your work environment, even if it seems you work with all women. This man will likely support you even if you’ve not met him yet, and you may be very glad soon if you’ve prepared for scrutiny at all times. The King of Pentacles card may mean good things to come in your love life. Someone may soon come along that will sweep you off your feet, and you will enjoy this most if you do not try to pretend about who you. Honestly will likely make everything to fall into place, and you will be loved for exactly who you are. If you are in a committed relationship, you may enter a new phase of comfort and love. If you are feeling dissatisfied, you may need to speak your mind about needed changes in order for this to occur. The King of Pentacles card may mean that you will soon experience positive financial growth as a result of your own efforts or investments. Now is a good time to take carefully calculated risks and avoid getting carried away. Sharing your wealth when you are able may position you for continued prosperity in your life. The Queen of Pentacles card may mean that you need to trust yourself even if your spiritual views differ from others around you. You may need to choose a belief system that works well for you, even if others do not agree with your decision.